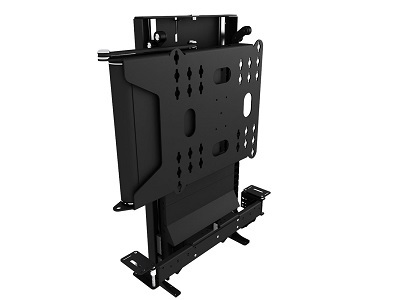 This is an innovative new TV lift mechanism suitable for screen sizes from 32 inch to 60 inch +. The LSM-FSE & LSM-PSE in 5 different models and due to its incredibly compact design cabinet makers can keep build in height requirements to a minimum. The LSM-FSE & LSM-PSE flat screen lifting mechanism features the addition of Future Automation's FSE & PSE which provide a full 90 degree swing out hinge motion. 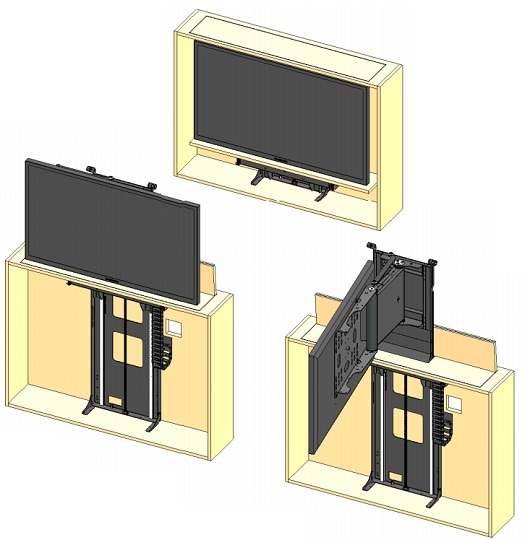 The LSM-FSE & LSM-PS is ideal for customers who want to view their TV from multiple positions such as end of bed cabinets or for when the cabinet is backed up against a wall. As with all Future Automation lifts the lift features a near silent motor system which raises a screen from within a cabinet up into the correct viewing position. The LSM-FSE LSM-PSE is not only height efficient but offers the addition of the swing out action making it one of the most innovative designs on the market. and makes for a valuable addition to AV Installs range of TV lifting mechanisms. A push up lid and the limitless width design ensure simple and quick installation and ease of fitting. The LSL-FSE & LSM-PSE TV lift mechanism can be controlled by RS232, contact closure and as standard comes complete with an IR remote control making it fully compatible with most brands of home automation control systems. Also available is a RF remote option which will allow the lift to operate by remote out of the line of sight, a handy addition if the unit is not being configured to an existing control system. There are five models across both the FSE and PSE range with standard heights to choose from, below are the details of the maximum cabinet height along with maximum screen heights for each model. If you require any assistance please don't hesitate to call 01604 493 755 and ask to speak to Boyd our Senior Engineer. Could you send me a price list for this product? Is this lift only left to the left or is there a version where it can swing right?